These Pet Rescue level 658 cheats and tips will help you beat level 658 of Pet Rescue. 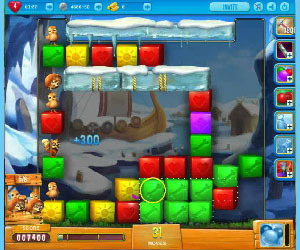 The objective of Pet Rescue level 658 is to rescue 8 pets and score 12,000 points in 50 moves. To start Pet Rescue Saga level 658, there is only one opening to have the blocks drop down. You will need to unlock the key in order to unlock the other two openings. Once these opening have been unlocked, more blocks and pets will fall onto the board. Focus on making combinations on the left side of the board until you have unlocked the key. Once you have unlocked the blocks, start making large combinations to get the pets on the board. The pets will take a few moves to come onto the board. Be patient. Once the pets are on the board, find out where they are on the board and the most effective way to bring them down. There are not many boosters to use in this level. The balloon booster is the only thing you will have in this level. Look to activate the balloon booster when it is full. Make sure to place it in an area of the board where it will do the most damage to the blocks underneath the pets. If necessary, use the hammer booster to help you remove one of the blocks in your way.